The Washington Post reports that Democrats are dominating early voting in Nevada. Business Insider notes that Latino early voting in Florida is up 99 percent over 2012’s figures, suggesting a strong showing for Hillary Clinton there. But Fox News warns that the early voting numbers indicate a very close race. 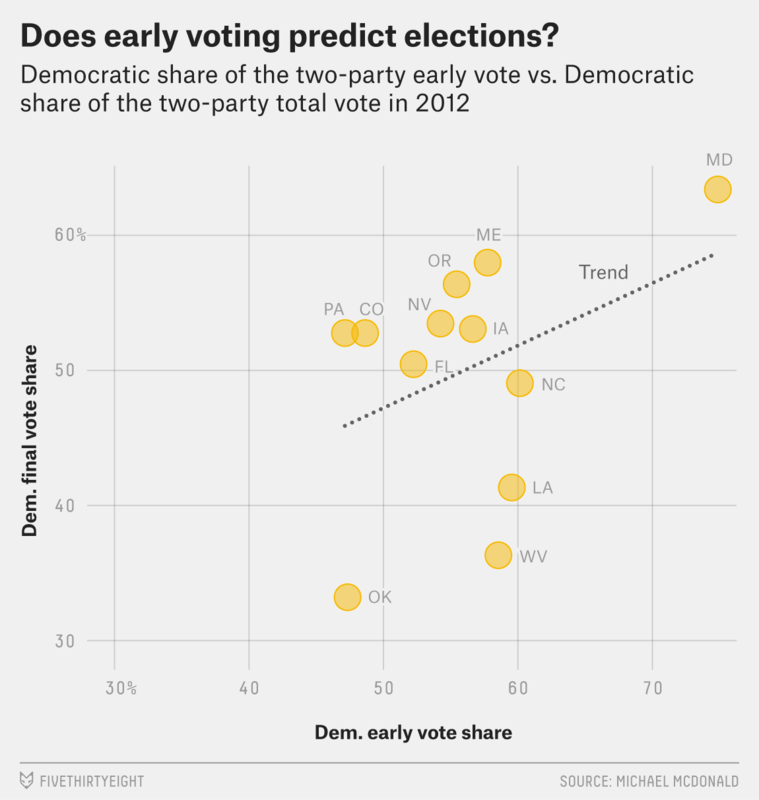 These divergent views serve as an important reminder that as popular as early voting is, it doesn’t actually tell us very much about who’s going to win the election. The former very weakly predicts the latter. Yes, the relationship is positive, but it’s pretty noisy.1 In other words, knowing how a party is doing in early voting doesn’t tell you much about how it will do once all the votes are counted. Indeed, if you were relying on early votes to forecast what was going to happen on Election Day in 2012, you’d get wildly misleading results. Democrats maintained substantial leads among early voters in North Carolina, Louisiana and West Virginia, and were trailing by a relatively narrow margin in Oklahoma, but still lost those states when all the votes were counted. Republicans won early voters in Pennsylvania and Colorado but lost the final tallies there. Maryland was a safely Democratic state in 2012, but the 75 percent of the early vote that went the Democrats’ way was a far cry from the 63 percent of the total vote they won once voting was finished. Part of the problem is that the party breakdowns in early voting statistics derive from party registration figures, which can be unreliable. Party registration, moreover, doesn’t always correspond with how a person votes. States like West Virginia and Louisiana have a strong voter registration advantage for Democrats, but those states have reliably voted for the Republican at the top of the ticket in the last four presidential elections. Another problem is that early votes constitute only about a quarter to a third of the total electorate and are a very unrepresentative sample of it. The people the campaigns target for early voting aren’t necessarily the same sorts of voters who will show up on Election Day. Now, early voting can still provide some useful insights. It can give us a rough idea of voter enthusiasm. Presumably, people who are more eager to turn out or are worried about Election Day lines are more likely to show up early. Early voting can also serve as an indicator of the relative strengths of campaign ground games. Many voters may not know how and where to vote, so they rely on campaigns to tell them about the logistics. If Democrats really are showing up early in many swing states, perhaps that’s the result of Clinton’s field office advantage over Trump. Generally, though, if you want to know what’s going to happen on Election Day, you’re far better off consulting the polls. Or, you know, waiting two weeks.